Kevin Dern, Dewey’s Pizza director of community outreach, and Dewey’s Clifton staff present the Literacy Network with a check from the Pizza School: Liz Priestle, Annie Schneider, Dewey’s Clifton staff (in light blue and black shirts), Kevin Dern (holding check), Michelle Otten Guenther and Shannon Lienemann. 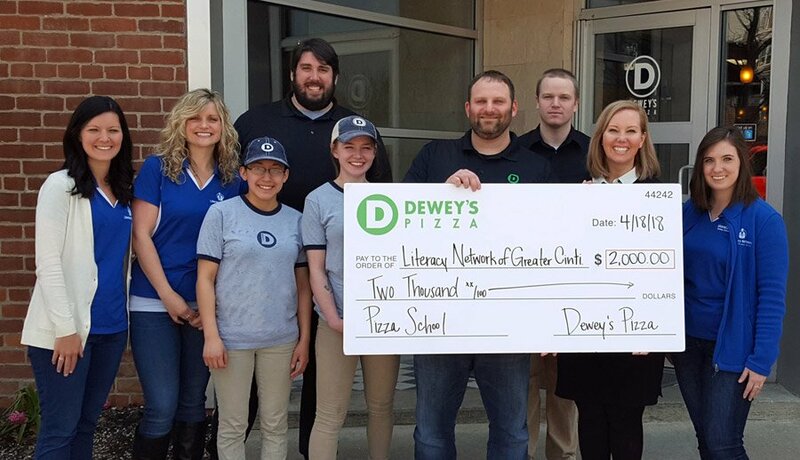 Dewey’s Pizza School in Clifton generated $2,000 for the Literacy Network. The Dewey schools are a family-friendly, creative way to raise funds for nonprofit organizations in the community through the Dewey’s DewMore Initiative. This program engages employees from Dewey’s restaurants to support communities through volunteer work and fundraising. The Pizza School allows attendees to take a class behind the glass and learn from the pizza-making experts how to create their own pies. Dewey’s donates 100 percent of the proceeds to the nonprofit partner at each event. Donna Elsen, a Literacy Network Adult Basic Reading teacher, said the support was amazing.